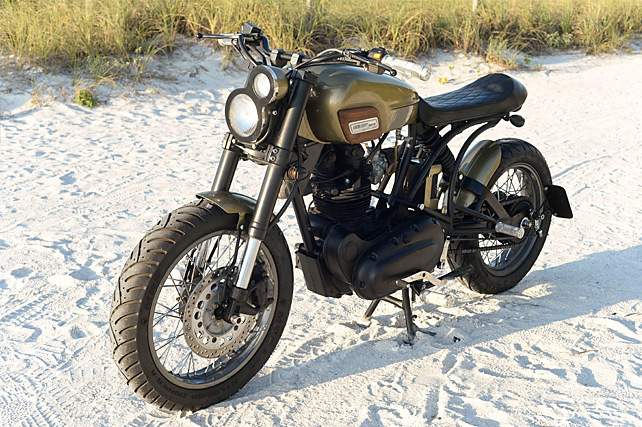 When you live in the United States your choice of bike builder is almost endless, but when Greg from Tampa Florida, serving in the US Military, emailed off his idea for a build one morning it landed in the inbox of New Delhi’s Bull City Customs. This it turned out was a brilliant idea, Greg wanted a Royal Enfield and where else but India would you go and it just so happened that he’d seen the Enfields Bull City had been turning out and wanted one of his own. 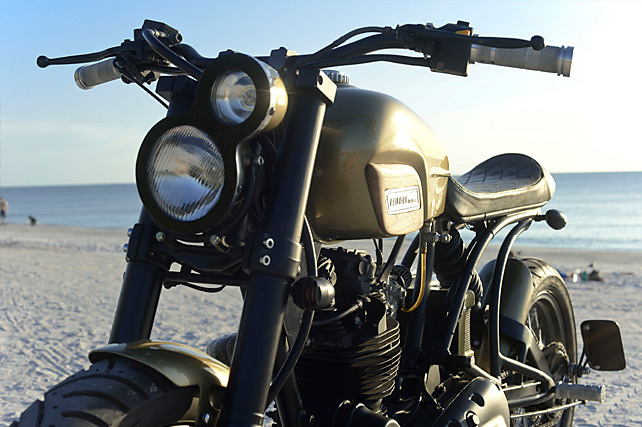 Based on a 2004 Royal Enfield AVL 350, head man Reginald Hilt was desperate not to let his new client down and together they come up with a concept for a Royal based Scrambler that would become known as “8”. The chassis work started straight away with the frame literally being cut to pieces so Bull City could build it back up in a way that would suit the Scrambler design they had given to Greg. The swingarm was ditched and a new monoshock design crafted from 1.5 inch thick tubing that places the rear shock mounts in a Ducati like position finishing under the seat for an excellent rear end feel. The subframe too was shown the door and a new item bent and cut from frame matching round tube that swoops up from the centre section and provides seat support at the rear. This design gives the sort of strength required for two up riding and the up-swept hooped seat mount is entirely separate pipe, rather than integrated, for improved strength. The seat itself is an all black affair, the dark leather fitting the theme of the bike brilliantly while the small hump is the perfect compromise of solo riding looks while still giving the room for a pillion. On such a quality build, it’s hard to pick stand out features but the tank is definitely one of them and fits perfectly with Reginald’s philosophy for this build “where the hard work and components stood out rather than just a fantastic looking paint job”. 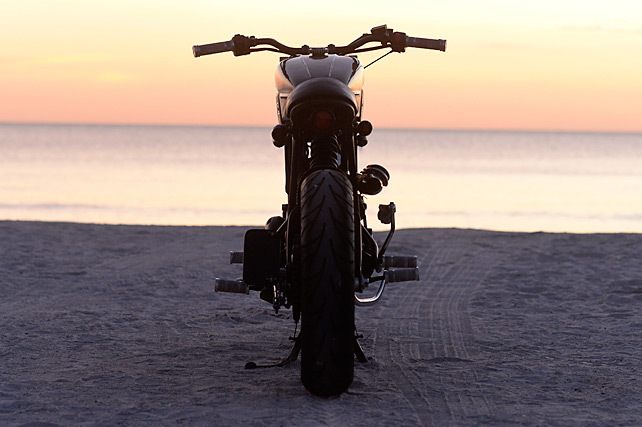 The fabrication of the tank started with inspiration being drawn from the lines of a Yamaha TX 750, giving broader shoulders than the standard item. Whereas an Enfield tank is a uniform shape the raised centre section and parallel crease lines help to give definition to once smooth surfaces, it’s subtle, but brilliant. To add that neo-vintage look Reginald was after he sought the help of his father who hand crafted a wooden teak panels that fit flawlessly into the fabricated sections. With the hand formed aluminium logos and Royal Enfield sprocket inspired cap in place the final decision was to find a colour that would show off the fabrication work. With Greg a serving member of the US military Bull City paid special homage to his service by laying down glorious coats of a light shade of Olive Green. Getting the suspension just right was vital for Reginald and he picked up a set of KTM 200 Duke Forks for the USD conversion. To give the bike a chunkier look a new upper clamp was fabricated and with the machines in full swing at Bull City they also made the risers. With the new monoshock design nothing from Royal Enfield would work for a rear shock so an adjustable item from the Indian market Yamaha Fazer was found to be the perfect fit. Wanting the bike to wear spoked rims the front is an 18inch item but the rear posed a problem, there wasn’t a 17inch item that would work. 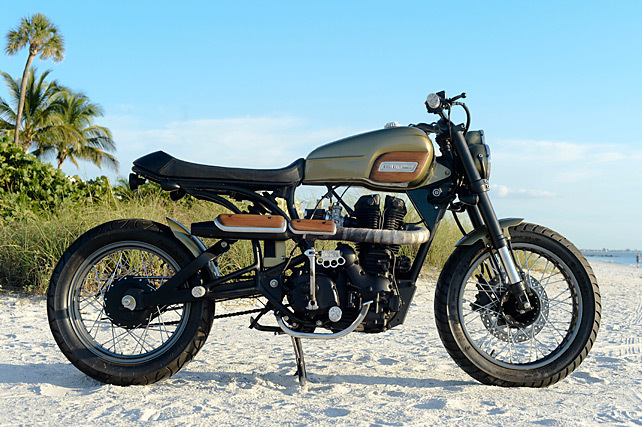 But as Guy Martin recently found on his Enfield powered adventures across India “Jugaad”, a colloquial term meaning an innovative fix or a solutions that bend rules is everywhere in the country and Bull City has it in spades. A KTM rear wheel was cut up to reveal the hub that was then drilled to take spokes and then even went so far as to adapt a drum brake into the hub, this is genius! 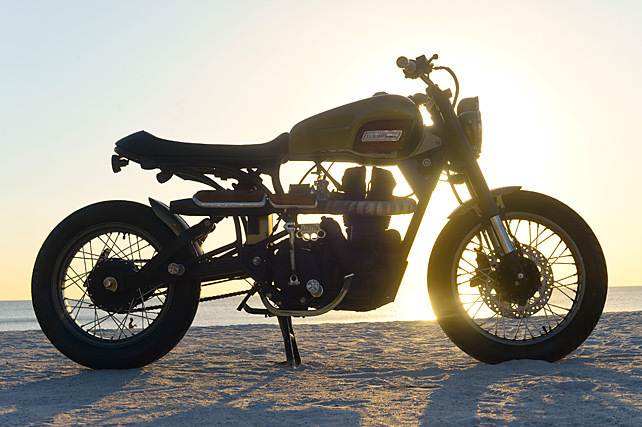 Being a newer model 350 the engine is an AVL item developed in Austria with sealed guides for improved lubrication, a lower running temperature and improved durability; just the thing for a Scrambler! But knowing the engine well, before Reginald had done anything else he fitted a new 29mm carburettor with a rejetted main and tuned properly these 346 cc engines become quite the little brawler. The small pod filter is the only shiny piece on the engine with the rest being entirely blacked out giving a far tougher look than you’d expect from a single with further muscle coming from the knuckle duster kick-start pedal. 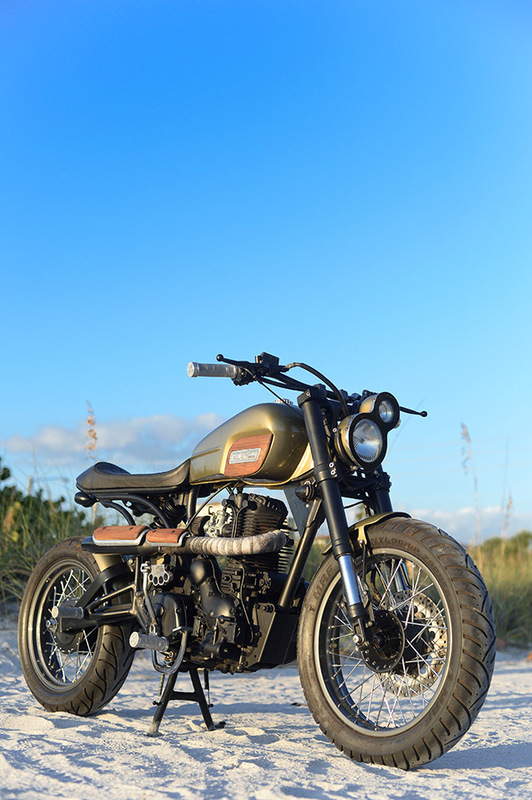 The standard exhaust would just never have worked on this build and so Bull City fabricated a new pipe that runs along the right side of the bike in true Scrambler style finishing in a blacked out single muffler. 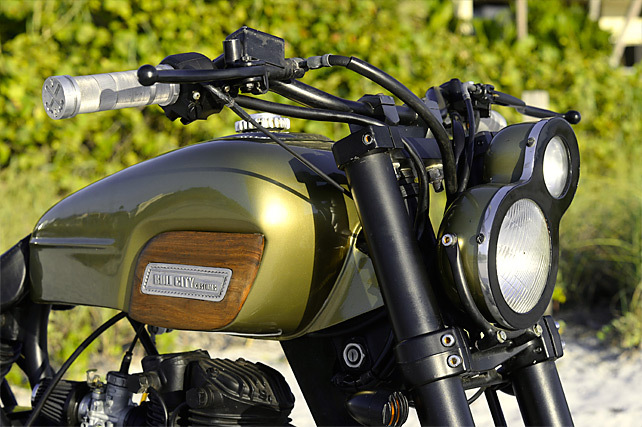 Heat shielding comes from wrapping the first half of the pipe then using metal covers protecting the rider’s leg with more of Dad’s brilliant timber work for that vintage touch. 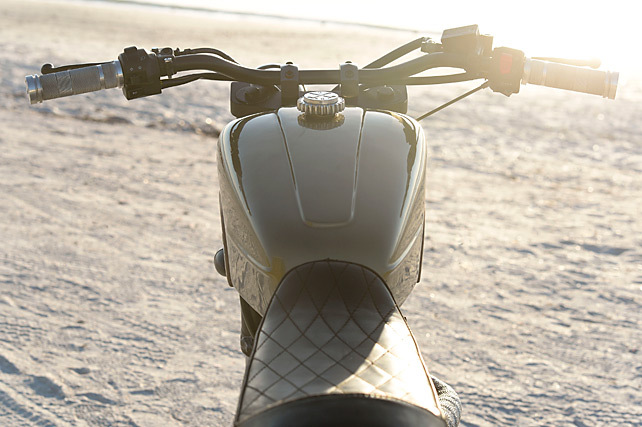 With innovation at every turn even the front headlight is something different, the top light is from a Rickshaw for a little Indian flavour with a larger Yamaha item offset and clamped with a custom surround to create the bikes name, the number eight. Machining aluminium parts is a love at Bull City and the front and rear footpegs and grips were all made in-house with their logo stamped into the ends. Small fenders front and rear are mounted the old school way with round bar before being painted, like the small battery box, in the same tank matching colour. Needing to be street legal but not wanting any visual distractions the rear tailight is a small unit tucked up under the seat while prison bar indicators couldn’t be more incognito. According to Reginald “This build in particular took us a longer time than usual as I wanted this build to be unique in its own way”. 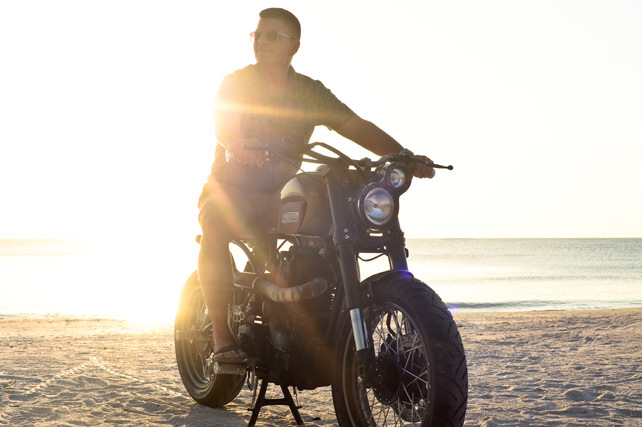 But the wait was more than worth it, when the bike landed in Florida it gave Greg just enough time to get acquainted with his new steed before taking out the “Most Original Ride” at the 2015 Distinguished Gentleman’s ride in Tampa.